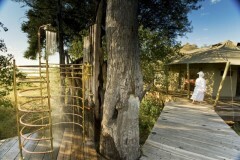 Zarafa Camp is only accessible to guests by scheduled air transfers or private air charters. On arrival at the airfield, the road transfer to camp is approximately an hour, including time for game viewing stops en route. The site have many excellent eco-friendly principles and is focussed on recycling, with repurposed teak railroad sleepers for flooring and furniture made from mahogany washed up in the 2005 tsunami, commissioned in an effort to give Indonesians affected by the disaster much-needed work. The result is a safari camp like no other, and one that you will quickly fall in love with and want to return to, time and again. 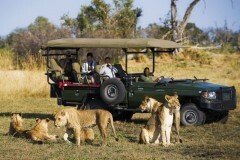 Leaving early in the morning or late afternoon in a 4x4 open vehicle and explore the exciting wilderness, undisturbed. 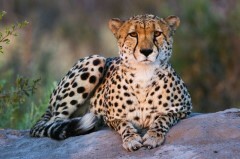 These times will be most ideal, as many wildlife species are active during these periods. Allow the world revolve around you, as you roam endlessly in the vehicle to seek exciting wildlife discoveries. 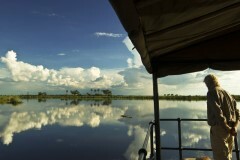 Explore within the Okavango and discover the unique habitats and species living in this environment. As it consists of water source, many wildlife can be easily sighted. Guided by the local staffs, chances of exciting moments such as lions preying for food and buffalos charging across the field will be seen throughout. Excursions are conditional to water levels and seasons. Having an one of a kind experience by dining under the sky, surrounded by amazing scenic views. Dine as the background changes like a performance show, giving many combinations of atmospheric dining experiences. Food provided are well prepared by local staffs and is catered to meet individual tastes. Throughout the reserve, animals are to be seen everywhere due to the abundance of water source near the camp. Hence you are able to sight for exotic species from the platforms of the camp. Weather conditions and time of the day will determine the appearances of animal species. 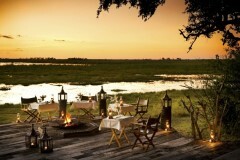 The Zarafa Camp located in the Botswana Safari is ideal to the adventurous travellers. 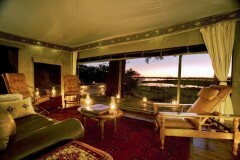 The camp is surrounded with simple, yet elegant interiors which demonstrated the vibe of the safari. There are common areas to share between the guests which include the lounge, dinning area and more. As this is a great opportunity to meet some friends and make the experience even better. Furthermore, the open areas within the camp is ideal for a panoramic view and relaxing breezes to comfort your mood. 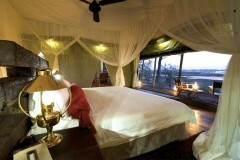 Comfortable and luxurious, this room is ideal for the safari explorer. The room have a big king sized bed to share and is also provides a private bathroom. The natural style interiors and warm lighting give an atmospheric vibe for pure relaxation. Each room is consisting of a desirable scenic view which allows individuals to view right into the distance and the movement of wildlife species. *Prices are per person per night and a minimum of 3 nights stay is recommended. Hotel rates are based on lead-in rooms. Other room types and hotels are available. Rates are subject to change and different rates may apply during holiday seasons and special events. Please contact us to enquire.